I’m a little surprised by the increase in non-payers over the years. Non payers by state. I’m not sure I agree with using ordinal coloring – especially when so many states fall into the 30-40% range. 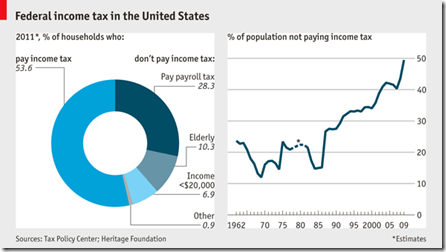 5 Responses to Who Pays Income Tax? The better question is to ask who believes they’re not paying taxes hidden in the cost of goods & services? It appears as if the large increase in non-payers begins about 2000. So perhaps the non-payers increased with President Bush’s tax cuts and the 2001 recession. And then from 2008 onward I would think the high unemployment rate would reduce the income of many individuals to levels where they no longer need to pay. But that’s a back-of-the-envelope guess. Brendan: you’re on the right track. The latest numbers we have are from 2009. And that is the ONLY place 47% comes from, i.e., 47% of tax units did not owe income tax for 2009. Therefore, this number was created by the overlap in the Bush tax cuts, and the massive layoffs of 2008/9. We don’t have new numbers yet, so this % has probably gone down as employment has gone slightly up. 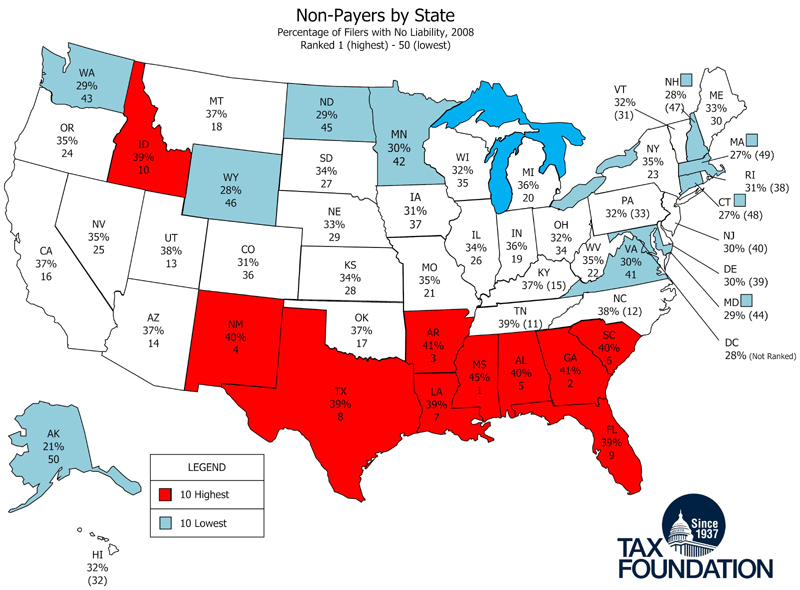 Plus, as Jay Dee pointed out, almost all people are still paying sales tax (in certain states), gas tax, all kinds of other taxes, as well as the payroll taxes that are mentioned in the graphic. This is a rare case where well-placed vertical gridlines would really help, it’s really hard to see which years (therefore which events) might have contributed to the big changes in the recent years. – Would injured veterans of Iraq and Afghanistan be a large enough demographic to influence national statistics like these? They’re an obvious category of people not paying income tax that wouldn’t have existed prior to 2001. On a similar note, do people serving in the military pay federal income tax? A reply to my own comment – it’s like they read my mind… (or more likely someone else had the same comment). They’ve updated the chart on their site to include vertical gridlines that also indicate presidential terms. Much more usable.